Writing letters is pretty much a thing of the past, something that just isn’t done anymore. The art of letter writing as a method of communication has been lost to the 21st century technologies of smart phones and e-mail. 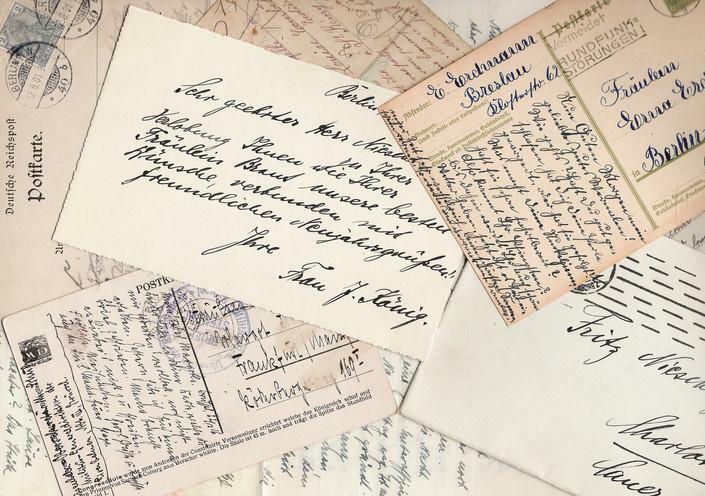 Their rarity and the insights they provide make family letters prized by family researchers. Historical letters can make a critical impact on your family research. If you are fortunate enough to have family correspondence in your genealogy records collection, you have a true treasure. If your ancestors had the foresight to save and preserve their letters, they can serve as the centerpiece of your genealogy research. Family letters capture pretty much whatever was going on in the author’s life at the time they were written and may include subjects like local gossip, deaths, travel, holidays and world events. These are just the details about our ancestor’s daily lives that make family researchers salivate as they seek to understand their lives. Some feel that family letters should be destroyed to protect the privacy of the participants. No one would even consider destroying the letters written by historical figures, so why would it be OK for your lesser known relatives? The thoughts of family members, captured on paper, provide a fascinating glimpse into their lives. Letters provide details and perspectives that you can’t get from traditional genealogical records. That is what makes them so valuable and special. Unfortunately, most family letters were discarded after they were read by their recipients. Typically, only letters that were considered to have special significance, such as a soldier away at war or love letters were carefully preserved. It is a shame that most of this correspondence and captured history has been lost to time. Below is a description of my experience of acquiring a set of family letters covering a time span of 1916-1925. My ancestors were immigrants from Germany who landed in North Dakota and homesteaded a farm a few miles from the Canadian border. It is only through a chance series of events that the letters of my family members survived to this day. The letters were authored by great grandfather’s family to their cousins who used to live near them back in their homeland of Germany. When a letter was received by one cousin, it was passed around until it reached the last cousin who saved all the correspondence. When the holder of these letters died, the stack of letters was destined for the burning barrel. But one family member had second thoughts about saving them. By happenstance, another relative known to research family history made an inquiry about obtaining the family letters, on the off chance that no one else had an interest in them. He made scans of all the documents and freely shared all his finds with interested family members (including me). In a flash, those letters could have literally gone up in smoke and be gone forever. 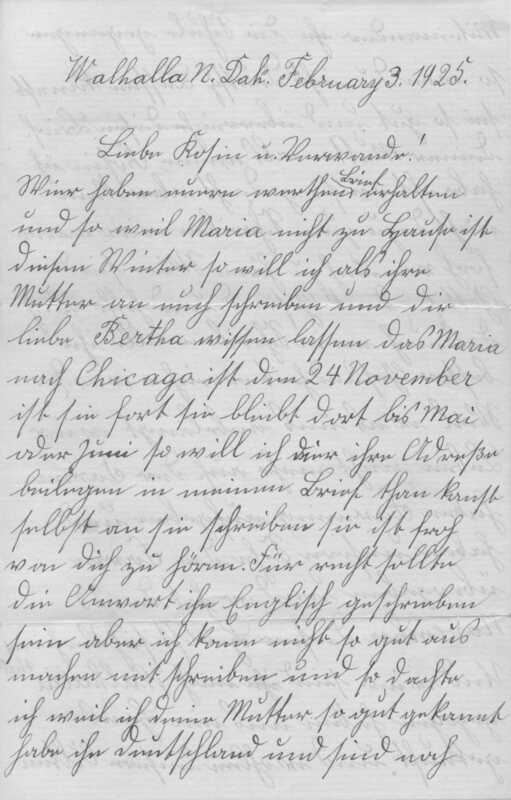 We have received your very valued letter and since Maria is not at home this winter, so I as her mother, will write to you and let dear Bertha know, that Maria left for Chicago on November 24. She will stay until May or June, so I want to include her address in my letter. She will be glad to hear from you. The answer should be written in English, but I cannot write that well and since I thought I know your mother really well in Germany and are still and went to school together and in case you cannot read German give the letter to your mother, my cousin. I have thought of her quite often, but did not find the time to write to her. We were happy to hear from you. We are, thank God, healthy and hope that the letter finds you all in best health. What pertains to us, we live no longer on the farm. We gave up farming and turned the farm over to our son and he married on November 23, this fall. We moved to Walhalla, bought a house and want to spend our old age quietly because we have done our part of the work. We are getting old and we are not able to work as before. We thought it is best to stop, Joseph is already 74 years old and I am 64. It is a considerable age. We can go to Holy Mass every day and on Sundays attend two Masses, that is the best we can do, since the time will come when we need to think about dying and nothing follows us as the good deeds. So we must think about the wellbeing of our souls. Dear cousin, I only heard a short time ago, that your brother Wolf already passed away this Fall. That really surprised me since we left school together, he had his birthday in August and I on November 23 and he was my youngest brother Georg, really was a good man. So time passes and one after the other goes to eternity. Dear cousin, what is your sister Barbara doing? Is she well also and do you meet sometimes? The month of December was cold here too, January was not too bad, we had almost no snow, but the cold wind blows once in a while rather fiercely. Last winter was much better, it made the time go faster, summer was not hot here always the nights are cool, but everything grew well, we had a good harvest, wheat has grown well and also yielded well, as did barley and oats. The price is also better this winter, it is better for the farmers, since last year the wheat was rather rusty. It did not yield well. It has not been good for two years for the farmers, since the price for all grains was so low. My daughter graduated on the 5th of December from her training, she did well during her 3 years. Now she can earn money for herself. It was a long training but she was happy and besides she worked every day to earn something. The patients really like her very well. It is hard work if you have to spend the nights like that, it is worth 5 dollars, since there are always weak patients who need care. I found it quite interesting that she felt compelled to go to mass every day and twice on Sunday. I guess you have to do daily maintenance on your soul when you get to the advanced age of 64! The letter also showed what was important in her life: her daughter’s nursing training, weather, crop yields, commodity prices, and the welfare of her relatives. Don’t assume that just because you did not inherit your ancestor’s letter correspondence that none exists. Often, other family members are in possession of family keepsakes. It is important to communicate your interest in family history to all of your family members and ask if they might be in possession of any family letters. There is no telling what gems your distant cousins might have squirreled away. You can also check out archives, libraries and newspapers for more information about your ancestor’s life. There is an off chance that a family letter got published. You never know what you might find ... once you start looking.